Poets Cornelius Eady (reading from his iPad), Marie Howe (of the fabulous hair), and Philip Schultz (a poet’s poignancy in his countenance) read in Rochester, with local poet and MCC Professor Tony Leuzzi (far right) moderating the conversation. Last night I went to a terrific reading in town through Rochester Arts & Lectures, featuring Cornelius Eady, Marie Howe, and Philip Schultz—poets all originally from Rochester. MCC professor and poet Anthony Leuzzi did a wonderful job moderating the reading and conversation. Eady, Howe, and Schultz addressed the role Rochester played in their lives as poets and how they think of home now (none of the three stayed in town, but draw from their time there in their writing). Each described a different Rochester, a different sense of place, a different home—Eady described his street in the city neighborhood now called Corn Hill; Howe spoke of growing up in the suburbs in a fake Tudor stone house with a swimming pool in a neighborhood of Irish Catholics, but did not specify which town or area (I found this especially interesting—the absence of detail here; as a product of the suburbs myself, I have always been acutely aware of the distinctions between the different towns and suburbs, and even neighborhoods within the same municipality—I don’t see them at all as all the same). Schultz spoke about growing up on a street of immigrants in the city, and at some point moved to my hometown / suburb, Brighton, which borders Rochester. Eady and Howe both talked about the same block on Prince Street, which played an important role in their lives. Howe read poems from her first book, What the Living Do, which was written largely about her brother John’s death from AIDS in 1989; John died on Prince Street in Rochester, and some of the poems are set there. Eventually, all left home. Eady and Howe spoke of wanting to be where people were—where everyone was—all together on the streets. And this place was New York. That resonated with me and with others I know who grew up here. Schultz said it was more that he was fleeing where he was—that he had to leave the pain of his situation in Rochester more than getting to New York. I just jotted down some notes, because I found the conversation and poems so inspiring. Not only are they all beautiful poets, they read poems grappling with identity, place, and the lost worlds of their childhood and adolescence in Rochester. All stuff I think about often. I had heard Cornelius read before, and have some of his poetry, but weirdly enough, was not familiar with Howe and Schultz. Marie Howe: [On the power of poetry]: “What poetry can do—turn our lives into myth.” From the elegiac title poem of What the Living Do, written to Howe’s brother John, these last lines stayed with me: “I am living. I remember you.” I woke up two days later still thinking about these words and the relationship between those of us still living with ones we love, long passed. Cornelius Eady: [On coming back to Rochester]: “Driving around the neighborhood, looking at things that aren’t there.” Also this—worlds gone by, vanished, lost, another era, another time. Eady: Described a kind of “adolescent panic” to get out—“the larger world was calling to me and I to it…Writers are ambitious. 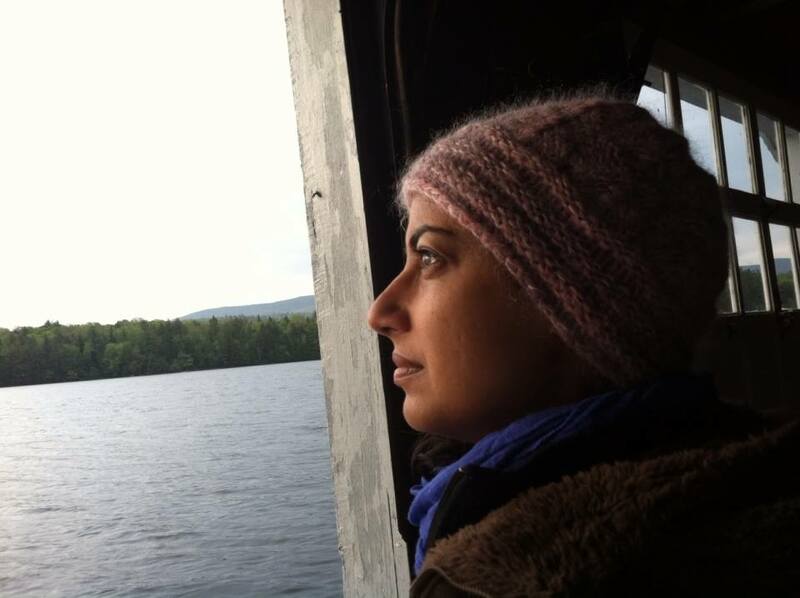 New York tested and pushed me in different ways…and I needed NY for that.” Eady mentioned an important mentor, poet Shreela Ray (who has since passed). Sadly, I never met Ray, but I have her book, Night Conversations with None Other, and have had it for a long time. I need to read it again. Schultz: [Quoting from what his wife has called the best or truest line of one of his poems]: “I left town, but failed to get away” (from his poem, “Failure”). This last line reminded me of a sentence in Bharati Mukherjee’s novel, Jasmine, which has stayed with me for nearly 25 years: “The world is divided between those who stay and those who leave.” I appreciate that Schultz’s words suggested something perhaps more subtle and complicated than Mukherjee’s distinction. (However, I think what the narrator says in Jasmine has a great deal of truth to it as well.) Reader, I’d be interested in hearing your thoughts on staying versus leaving (in life and writing), should you have any you’d like to share. Molly’s wanderlust / continents tattoo, designed to resemble henna, caught my eye at a charging station at JFK and sparked my conversation with her. In the car on the way to the airport, my husband (R), more careful than I, asked the requisite last minute questions—Do you have your passport? (Yes, packed since last week). Do you have your visa? This second question gave me pause. I had a current visa, yes. The problem was that my 10-year visa to India, a total pain to get, was on my previous, expired passport. I had not really used my passport since my last trip to India four years ago, and therefore had not made the connection that my visa was on the old passport…and that my old passport was still in our apartment. We turned around and I ran back into the apartment to retrieve my expired passport. Had I left it with other inessentials at my parents’ house instead of at our new place, we would have missed the flight to New York—which meant we likely would not have made our other flights. We are flying together for the first time—to New York and then to Chennai via Dubai—in order to have me meet R’s grandmother and other relatives. Not only is it our first flight together, it is our first overseas trip, as well as my first time traveling with my in-laws. We are meeting them in Chennai. It’s not a low-stakes trip—but then nothing about this year has been low stakes. It turned out that having a current visa on my old passport was good enough, but I had watched the look on my husband’s face and registered the sinking in my stomach, thinking of his parents who had spent time and effort planning our itinerary and what they would say if I was unable to go. Go without me, I said to R. I can go to the consulate in NY and then take a later flight. It’s not that easy, R said. We looked at each other. Maybe they just won’t let us go. How could we not think about the irrational fear of Muslims or anyone who is brown or “different?” The fear that anyone who looks like us (two tired teachers) could be terrorists. The unbelievable rise of Trump. The fact that flights this time of year are packed. I wasn’t thinking about the time of year—school vacations, holidays. I wasn’t thinking about the color of our skin. Being married means having to think about things more. It’s not just my own trip I would have derailed, which (while not ideal), I could have dealt with. It has been over four years since I have left the country other than a few quick jaunts to Toronto. I had forgotten many things until the last week—calling my credit card company so they don’t freeze my account after a foreign transaction; packing extra Ziploc bags, toilet paper, and Kleenex; filling prescriptions for malaria meds. Even being in NYC (even just JFK) is a different country. This past fall, I did a little writing-related travel and attended a LOT of readings. I was out a lot, but not dancing and not seeing the world. Not writing as much as I want and need to. I think I tried to make up for a year where I felt underwater and in a country where I did not speak the language— the world of living with a sick family member (my grandmother—her stroke in my bed, calling 911, my family and I at the hospital and Jewish Home in shifts) and the almost equally strange and horrifying (to me) world of wedding planning minutiae and decisions (themes, colors, invitations, guest lists, seating arrangements, menus) collided. I felt frequently mute and as though I could not stop talking and also was not heard. It was though we (R and I) were living inside a snow globe. The rest of the world went on outside it. Or the rest of the world was the globe and I was adrift in some other galaxy—the world of pale yellow hospital masks and thickening agents, countless sari blouse measurements and fittings, and telling my ninth graders on repeat that it was “minus five” each time they forgot to bring their copies of Romeo & Juliet or a writing implement to class. We muddled our way through Shakespeare and the end of the school year. My grandmother is able to swallow again, to speak again, to walk. I survived wedding planning, moving, and the first six months of marriage. Even with potential visa troubles last week, I realized I still have my real passport—a clean bill of health, a reason to travel (a grandmother to meet), the resources to make it possible, a companion with whom to go. I realize these are not small things; these are everything. I am grateful. The wanderlust tattoo: At JFK, I met Molly and her friend Linda, who were en route to Dubai, Kenya, and the Maldives. They were on their way to meet friends from Sweden. They met these friends four years ago (while traveling); now they all sport the same tattoo and travel together. I didn’t ask Molly what she or Linda do for work in Cleveland or if they have spouses or children. It didn’t seem to matter, because it doesn’t. They are travelers. That is enough. I had a wonderful time attending the NonfictioNOW 2015 Conference at Northern Arizona University in Flagstaff. Here’s a write-up of the panel I was on — about “the lyric moment” in both lyric poems and the lyric essay. I wrote poetry first and still think of myself (in many ways) as a poet who happens to work mostly in prose these days. 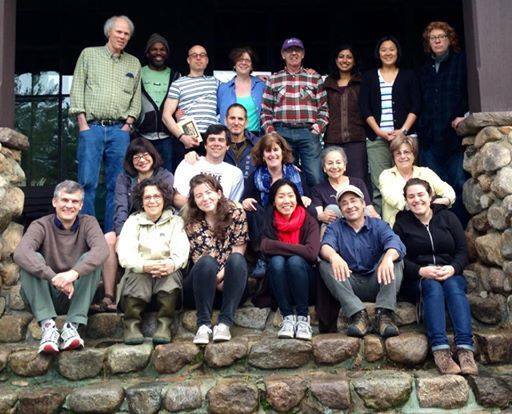 Thank you, Heidi Czerwiec, for blogging about so many of the terrific creative nonfiction panels for Assay: A Journal of Nonfiction Studies — a true example of literary citizenship. Panel description: When Samuel Taylor Coleridge set off in pursuit of “a semblance of truth sufficient to procure for these shadows of imagination that willing suspension of disbelief for the moment, which constitutes poetic faith,” the phrase “suspension of disbelief” entered the poetic lexicon. It can be argued that an equivalent poetic faith is at the heart of the lyric essay. However, despite sharing similar impulses and effects, the lyric essay and the lyric poem handle, develop, and court poetic faith in different manners. There is a distinct difference between the suspension of disbelief in poetry and the development or maintenance of actual belief in the essay. This panel of poets, essayists, and editors will discuss the lyric essay in relation to the lyric poem, and consider what constitutes a “poetic faith” in nonfiction. The internet offered up some unexpected loveliness tonight. Andrea Beltran (a poet I haven’t yet met) wrote notes from last year’s AWP conference in Seattle, in her blog post titled, “The emotional infrastructure of the world.” What can one say (in summation) after several days across the country with 13,000 other writers? I am grateful that Andrea included a few lines from the panel I moderated. It’s strange and humbling to find out that sometimes the words you need to read are your own. Our panel, “Race and Belonging: Navigating the MFA Program as a Writer of Color,” convened on March 1st, 2014. It was the last day of the hectic conference, and two months before The New Yorker published Junot Diaz’ brilliant “MFA vs. POC” essay, which threw greater light and attention on a conversation many of us have had for years. 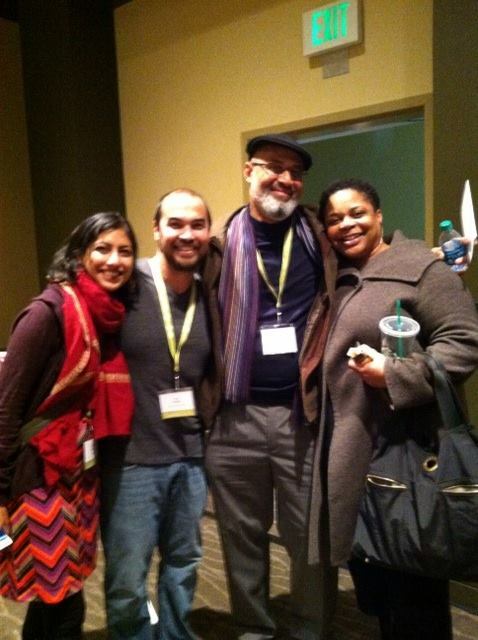 Writers Sejal Shah, Jon Pineda, Tim Seibles, and Crystal Williams at AWP 2014 in Seattle, post panel. We’re missing Eduardo C. Corral and panel organizer, Cathy Linh Che. Read Andrea’s whole post here: The emotional infrastructure of the world. I’m looking forward to AWP 2015 and hope to meet Andrea (and see you, reader) then. “Keep Ithaka always in your mind. Arriving there is what you are destined for. But do not hurry the journey at all.” –C.P. Cavafy, Collected Poems. Translated by Edmund Keeley and Philip Sherrard. 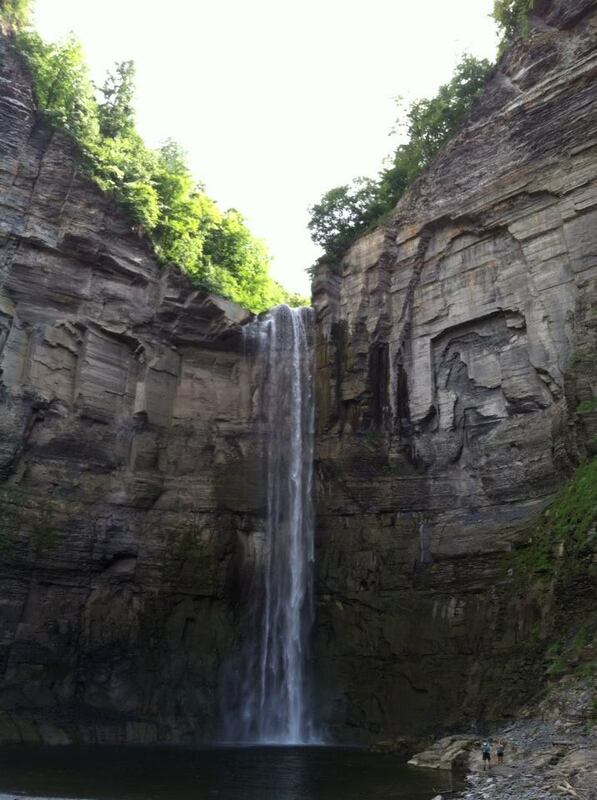 For the last 19 years, while living in New York City, Massachusetts, Iowa, and Rochester, I have regularly visited friends in Ithaca, New York. This past spring I also taught selections from The Odyssey and thought about that other classical Ithaka. After months of planning (to find a weekend that worked for both sets of my friends and for us), my fiance and I finally drove to Ithaca, NY, last weekend. It was a relief to have an easy getaway in a summer that has been unexpectedly busy with our engagement ceremony, family and friends visiting, writing projects, and some of our own longer travels (to visit family and for a wedding). My MFA thesis, a collection of stories called Ithaca Is Never Far, deals with the search for home– both cultural and geographic. The title story is a retelling of The Odyssey from Penelope’s point of view. It was also, for me, about growing up in Western New York State–a place often considered at some remove from New York City, other East Coast cities, and anything cosmopolitan. Although I resented the idea of New York State as some sort of culturally remote backwater when I was growing up, after living in NYC myself for six years on and off across 10 years, it is sometimes challenging for me to be back here. I miss the caffeinated buzz of the city–a constant electric hum–, its diversity, my friends and family who still live there. Devouring all of Goodbye to All That: Writers on Loving and Leaving New York (a birthday present from my friend Sally) in one sitting a few weeks ago made me miss the city even more. These days, I am not able to get back to New York as often as I would like. (My last trip was a one-day whirlwind visit in April to give a reading at the College of Staten Island with my friend, fiction writer Stephen Schottenfeld.) I try to appreciate what is here, including the quiet charms of my hometown: great restaurants, ridiculously easy commutes, friends I have known for years, my 91 year-old grandmother, a good job with kind colleagues, a lower cost of living, the natural beauty of places like Ithaca. And I met my fiance, also a native Rochesterian, here. I don’t know where the future will take me–whether I will settle down here or if Rochester is one more stop along the way. Cavafy’s poem reminds me to be patient, to not hurry the journey.